1. How can I communicate with the SSSC Board members ? Before contacting a club officer with a question, please review these Frequently Asked Questions (FAQ’s) in the below sections. Attend the annual SSSC general membership meeting in January. 2. Is the SSSC registered with the Civilian Marksmanship Program ? 3. Can I host a special event at the SSSC range ? Yes. Special events—training classes, shooting programs—can be accommodated. The Club’s board of directors must review and approve all requests in advance. Refer to the Forms section of the web site for an Event Request & Authorization form to complete and submit to the SSSC board. 4. What is the policy regarding use of the new electrical power at SSSC range ? Installation of electrical power to the range was completed in October, 2016. In addition to power receptacles along the shooting line, lights were installed along the shooting line, and heaters installed in the clubhouse. The range light switches and the clubhouse are locked, but are available for approved events. The unlocked power receptacles along the shooting line are active and available for member use. 1. What are the requirements for a NEW SSSC individual membership ? 2. What are the requirements for a RENEWAL of a current SSSC individual membership ? 3. What are the requirements for an SSSC individual membership for a PREVIOUS MEMBER that allowed their membership to expire ? Previous members who have allowed their membership to lapse and wish to rejoin–but have never attended a Safety Orientation class–must follow the NEW MEMBER application procedure, including attending a Safety Orientation class. Previous members who have allowed their membership to lapse and wish to rejoin–and are confirmed to have previously attended a Safety Orientation class–must follow the NEW MEMBER application procedure, but are not required to attend another Safety Orientation class. 4. If I am a life member of the NRA or a life member of the SSSC, previously filled out the SSSC membership paperwork, and my personal information has not changed, why do I have to complete more paperwork each year to continue my membership ? All new applicants, renewing applicants, previous members who are reapplying after an interruption in membership, NRA life members, and SSSC life members are required to follow the procedures for on-going SSSC membership. The annual membership procedures can be found on the club’s Web site (www.SangreShooting.com/membership/). These parameters are in place to protect our privileged status with and allegiance to the NRA, to frequently remind participants of the more important safety rules, and to keep our membership informed of changes and updates. Member safety, our insurance policy and legal responsibilities that relate to keeping our range, and staying up on policy changes, are some of the justifications for the implemented procedures. But, most importantly and simply, these are the club’s policies and procedures for membership. To a few of our associates the procedures might seem cumbersome. To the vast majority they are understood, accepted and followed. The SSSC policies & procedures and range rules are frequently reviewed, updated as necessary and implemented by the elected board of directors, as well as communicated to the membership at annual meetings. They are also published on the club’s Web site (www.SangreShooting.com), and the range rules are posted at the range. 5. Is the annual fee amount prorated if I join during the year ? 6. What types of memberships are available ? Only individual memberships are offered at this time. An individual membership affords the member all Club benefits, including: unsupervised access to the SSSC range facility and use of all range resources; participation in SSSC sponsored events; access to the Civilian marksmanship Program (CMP); and hosting of guests at the range, including up to two actively shooting guests. 7. Is there a special fee for family or other special memberships ? 8. As a new member applicant, how do I arrange for a range safety orientation class ? 9. After I’ve satisfied all of the new membership requirements, how soon will I be able to access the range ? Typically within 10-days of completion of all membership requirements, an individual range electronic gate code will be communicated to you via e-mail. 1. Where can I find the current SSSC safety rules ? 2. Are there any additional safety rules during an SSSC sponsored shooting event ? Yes. During any organized competitive, instructional, sight-in, or other SSC sponsored event, the event manager and Range Safety Officer (RSO) are responsible to ensure that all participants are reminded of the Four Basic Firearms Safety Rules, the applicable Range Safety Rules, plus advised of any added safety rules for the event. A pre-event safety orientation will be used to communicate this information. 3. What is the difference between a “general” and an “emergency” Cease Fire ?? A “general” Cease Fire is one called from time-to-time by the designated Range Safety Officer during sponsored events, or the person assuming the role of the Range Safety Officer during informal shooting activities, so that people may go down range to set, remove, or replace targets. During the general Cease Fire, all guns must be holstered, or unloaded and tabled or racked with actions opened. No guns shall be touched in any way while anyone is down range. An “emergency” Cease Fire is one called by anyone who suspects an unsafe condition—such as any person that steps forward (the down range side) of the firing line while the line is hot and shooting is taking place. Immediately upon an “emergency” Cease Fire being called out, all shooters should immediately stop shooting, and holster or table their guns until the unsafe condition is resolved. 4. Can you help me understand the “90-degree” or “45-degree” rule ?? The 90° and 45° rules are one-and-the-same depending on the point-of-view. While on the firing line, the muzzle of any firearm should not deviate more than 45 degrees in either direction from a line that is perpendicular to the firing line…which is a total of 90 degrees. This applies while guns are being: removed from or returned to gun cases; loaded and unloaded; presented from and returned to holsters, purses or fanny packs; worked on ( i.e. sight adjustments); or while shooting. This requires that targets are placed so that shooting at the targets will not require breaking of the 45-degree plane. 5. Can you help me understand how the “firing line,” “shooting tables, and “accessory tables” are defined ? The “firing line” is established by range design, and is a line that should not be passed when facing down range unless and until there is a cease fire period, or you are the only shooter on the range. For general/informal shooting, the firing line is a line parallel to the front edge of the shooting tables. Shooters may sit at the tables, or stand beside or immediately behind the table. All shooting must be from that firing line, not in front of or beyond it, nor from more than the table width behind it. For organized events the event manager and Range Safety Officer (RSO) may establish a different firing line for the event. 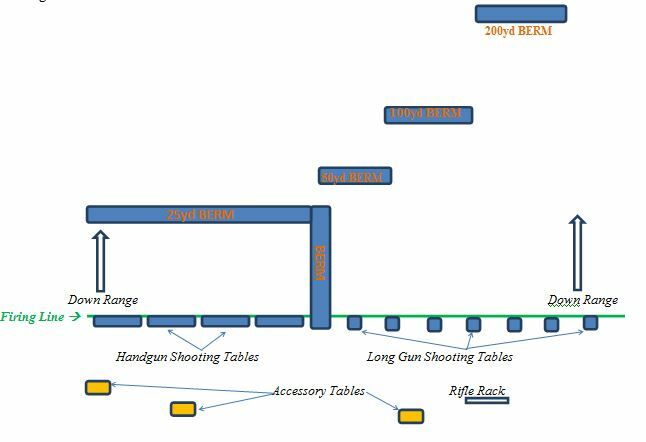 “Shooting tables” are permanently installed and either the long wooden tables on the handgun side of the range, or the metal seating tables on the long gun side of the range. Unless holstered, or racked, or being carried to/from your vehicles, the shooting tables are the only location for guns to be placed. Guns—whether cased or uncased—must be moved directly to/from the vehicle and the shooting table…and not during a cease fire while people are down range. “Accessory tables” are mobile wooden tables placed behind the shooting areas. These are meant to used for placement of carrying bags, empty gun cases, extra ammo, water bottles, and other general items…but not for guns. Guns should not be cased or uncased at the accessory tables as this means the guns are being handled behind the shooting tables. 6. Can I leave the range gate open while I am on the range, and leave it open if there are others still on the range when I leave ? The range gate must be locked upon each individual entry and exit. Simply stated, the reason is to mitigate our liability and keep our range. We need to take common sense steps to prevent unauthorized non-members from coming onto the facility and possibly getting hurt, or hurting someone else. An exception may be made by the Board of Directors to authorize a Club sponsored event’s designated Range Safety Officer to leave open the gate and monitor/control range activity. 7. What should I do if I witness unsafe behavior ? The SSSC insists that it is the responsibility of every shooter at the range to ensure the safety rules are being followed by all shooters. While it may be difficult to approach someone about a safety infraction, it is for their benefit as well as yours to do so. Typically, the offender will apologize if the infraction is pointed out politely with an explanation as to why it is unsafe. Should the offender become belligerent, or refuse to change his or her unsafe behavior, you should note their name or vehicle license number, and report the observed safety incident to the SSSC e-mail address (sssc8@live.com). You also may want to consider leaving the range so as to remove yourself from a potentially dangerous situation. While downrange managing your targets during a cease fire, you notice someone messing with his or her gun at their shooting table, i.e. adjusting sights, or uncasing/casing guns. As soon as you can, you should ask the person to please not touch their firearms while people are down range during a cease fire. While on the firing line, you witness a person breaking the 45-degree rule, pointing a muzzle in your direction. You should ask the person to not point their muzzle at you, and remind him or her about the 45-degree plane. 8. Do I understand that there are target stands supplied by the Club ? Yes. Target frames are provided by the Club—constructed/maintained by Club members—for use by the members. These frames are available in the oil storage tank, and must be returned to storage after use. Also, a steel target is permanently located at the 200 yard berm. 9. Can I bring my own targets to the range ? Remember ~ It is your responsibility to clean-up the range after your use. Remove and trash the used targets, and any fragmented pieces of your targets. Some targets are safety or fire hazards, and are strictly prohibited, i.e. : glass, cans, rocks, cinder blocks, propane tanks, exploding material (including Tannerite). Use of these kinds of targets may cause you to lose your membership. 10. Can I use my own steel targets ? No. Only pre-approved, Club sponsored events may utilize steel targets. While the Club’s board of directors appreciate that there are benefits to steel targets for practice and fun, we also recognize that there are safety trade-offs. Steel targets can be safely used if they are properly constructed, maintained and placed on the range. As the range is unsupervised however, the proper construction/use requirements cannot be monitored to provide a safe environment for all range participants. The Club has installed a steel target at the 200 yard berm. Armor piercing or steel-core ammunition is not permitted for use with this target. 11. Are there any ammunition restrictions ? Yes. To prevent fires that can devastate our area, incendiary and tracer ammunition is strictly prohibited. If shooting at the Club’s 200 yard steel target, armor piercing or steel core projectiles must not be used. 12. Can I shoot my 50 BMG rifle at the range ? 50 BMG ammunition is currently acceptable, but under review by the SSSC BOD due to its long distance destructive capability. Please remember to maintain strict muzzle control—just a 10-15 degree muzzle elevation could clear the top of the 200 yard berm. 13. Can I shoot an automatic machinegun or sub-machinegun at the range ? Yes. Please consider your target setup and others at the range when shooting an automatic. For example, you should alert other range participants that you are about to shoot an auto. 14. Can I practice drawing my handgun from a holster or various methods of concealment ?? If no one else is at the range, drawing from any form of concealment is permitted. For general safety reasons however, if others are on the range, only drawing from a strong side belt holster (open or concealed) is permitted. A strong side belt holster is defined as either inside the waistband or outside the waistband that is affixed to a waist belt, positioned in a neutral (straight) or only slightly canted vertical orientation, positioned on the belt so that the trigger pad is approximately along the centerline of the body (straight down from the armpit). Before practicing weapon presentation using open or concealment methods, the Club’s BOD strongly advises taking training from a competent personal defense instructor. 15. I notice a flagpole at the range. When is it used ? At all SSSC organized range activities, the range flag should be posted. When posted, any member wishing to use the range must obtain permission from the event manager of Range Safety Officer (RSO). 16. What are my responsibilities regarding range clean-up ? Each Individual Member is responsible for brass and trash cleanup for him/herself as well as invited Guests. Several trash cans and brass buckets are located throughout the range for your use. Some shooters feel that smaller caliber casings, i.e. 22lr, don’t need to be picked-up. This is an incorrect assumption…who else should pick-up the shooter’s small caliber brass ?? With the exception of biodegradable material—i.e. clay birds—fragmenting targets are frowned upon as these fragments accumulate over time and degrade the looks of the range. At least once per year, the BOD organize a general range clean-up day. We appreciate any and all members who participate to keep our range looking good…and we have fun too !! 1. As a current SSSC Individual Member, may I bring guests to the range as observers or for shooting ? Yes. SSSC members recognize that we are fortunate to have an excellent shooting facility, and we are anxious to introduce our children, friends and associates to firearms safety and shooting fun. Individual Member’s household family that do not qualify for membership, i.e. under 18 years old, not an active NRA member, etc. Friends, family or business associates that live nearby or are visiting from out-of-town. A shooting participant, or a non-shooting observer. All Guests, whether shooting or observing, must wear proper eye and ear protection. Guest privileges should not be abused. For example, a person that is a shooting Guest more than a couple times per year should consider an Individual Membership. For reasons of practical supervision and safety, there is a limit of two actively shooting Guests at any one time per hosting Individual Member. The hosting Individual Member has 100% responsibility and liability for the behavior and actions of all shooting and non-shooting Guests, from the time that they enter the range until they exit.